The racist war on terror continues to be a deadly reality for Muslims in Britain. On 31 January police conducted a series of dawn raids on Muslim homes in Birmingham, arresting nine men under the anti-terrorism laws on the pretext of a supposed plot to kidnap and behead a British Muslim soldier. Abu Bakr, one of the arrested men who was released after a week for lack of evidence, aptly described Blairs Britain as a police state for Muslims. Previous anti-terrorism raids by the cops have resulted in the killing of Brazilian electrician Jean Charles de Menezes in Stockwell Tube station in July 2005 and the shooting of Mohammed Abdul Kahar in Forest Gate, East London in June 2006. The US government is seeking the extradition of former School of Oriental and African Studies (SOAS) student and human rights campaigner Syed Talha Ahsan, together with Babar Ahmad, a former technician at Imperial College London. Ahsan was arrested on 19 July 2006, accused of conspiracy to provide material support and resources to persons engaged in acts of terrorism in Afghanistan, Chechnya and elsewhere. The Free Talha Ahsan campaign stated on 21 July 2006, Although the police have not charged him with any crime and have not found any criminal activity on his part, he is to face extradition to the US despite not having committed any criminal acts there (www.freetalhaahsan.com). Under the conditions of the Extradition Act 2003 between the US and Britain, no prima facie evidence is required for any terror suspect to be extradited, only that the US government provide documentation of the appearance of guilt. This is an outrage! On campuses, Zionists have been acting as auxiliaries of the US and British imperialists and the state of Israel, targeting the lecturers union, Muslim students and Palestinian activists. Nasser Amin, a Muslim student at SOAS was viciously witch-hunted for an article he wrote in the March 2005 issue of campus magazine SOAS Spirit advocating the Palestinian peoples right to defend themselves against murderous Israeli terrorism. He fought for and obtained an apology from former SOAS Principal Colin Bundy, who falsely claimed that Amin had been reprimanded, and received £5000 in compensation, but this will hardly make amends for the damage done to his life and his studies. It is in the vital interests of students, lecturers and campus workers to oppose the war on terror on campuses. At SOAS this means fighting to overturn the chauvinist English-only rule for societies literature upheld by the SOAS Student Union Clubs and Societies Guide which outrageously demands that All publicity must be in English, supposedly to ensure that the Equal Opportunities Policy is adhered to. Scandalously, Clare Solomon of the Socialist Workers Party (SWP) and Respect, who is part of the SOAS Student Union bureaucracy, tried to enforce this policy against the Spartacus Youth Group table at the September 2006 Freshers Fair. We vehemently opposed this attempt at anti-communist censorship at the time and have campaigned against the policy ever since, noting that it is aimed primarily at Muslims and will be used to target anyone who opposes British imperialism. SYG members have intervened into campus events and held regular sales of our literature (including in Arabic, Chinese, Turkish, Tagalog and other languages) and fought to overturn this threat to all students. Members of the SWP and Respect on campus are in an excruciating contradiction over this question: on the one hand they present themselves as defenders of Muslims; on the other hand as good reformists when elected to office in the student union they enforce the war on terror measures on behalf of the university administration and the bourgeois state, including the English-only policy. Thus with student union elections pending, Clare Solomons election leaflet claimed The rise in Islamophobia—with proposals to spy on Asian students is very worrying and said. Ive organised to fight Islamophobia. But her role in enforcing the English-only policy flatly contradicts this claim so she put her name to our motion to bolster her credentials among the multiethnic student population. However, her support for the motion doesnt amount to much; she let it drop off the end of the agenda at the meeting. The SWPs reformist programme can be seen fairly clearly through the perspectives of the Stop the War Coalition (StWC). A BBC news online report of the 24 February anti-war demonstration quotes leading SWPer and StWC convener Lindsey German stating that we must intensify our call for all troops to be withdrawn now and for Britain to break the link with George Bushs foreign policy. This is what the programme of the StWC amounts to: pressuring the capitalist rulers of Britain to break from US imperialism and change their priorities to delivering welfare not warfare. We call for: US/British troops out of Iraq and Afghanistan now! However our opposition to imperialism in these countries has nothing in common with social-patriotic calls to bring our boys home. British imperialism—which once possessed the most powerful empire in the world—is no less savage and brutal than US imperialism, simply weaker and more decrepit. As revolutionary Marxists, we understand that imperialism is not simply a foreign policy and the capitalist system cannot be reformed to serve the exploited and oppressed. The SWP is incapable of telling you the fundamental truth that racism, imperialist war and the violent repression of workers and minorities are intrinsic to the capitalist system and cannot be eradicated short of a socialist revolution led by the working class. We fight to build a multiethnic revolutionary workers party with the programme to sweep away this system once and for all and replace it with a workers state where those who produce the wealth of society will rule. As for defending Muslims, the SWPs opposition to Islamophobia is couched in a wholesale capitulation to Islam which, like all religions—including Christianity, the established religion in this country—is a tool for the oppression and subjugation of women. The SWPs capitulation to Islamic forces is nothing new. 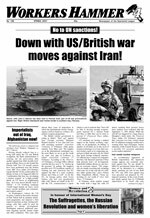 During the 1980s the SWP supported the US and British imperialists against the Soviet Union in Afghanistan, where the Red Army was fighting anti-woman CIA-backed mujahedin reactionaries who threw acid in the faces of unveiled women and shot school-teachers who dared to teach girls to read. We said Hail Red Army! and Extend the gains of the October Revolution to Afghan peoples! The Soviet withdrawal from Afghanistan in 1989 was the opening shot in counterrevolution in the USSR itself, which found the SWP rejoicing at Yeltsins 1991 countercoup heralding the destruction of the workers state. This was a world historic defeat of the proletariat and ushered in the reactionary period that we live in today. Although bureaucratically degenerated and undermined by Stalinist misrule, the Soviet Union continued to embody gains for the working class achieved through the overthrow of capitalist rule by the 1917 Bolshevik Revolution. We stood for unconditional military defence of the Soviet Union against imperialist attack and capitalist restoration and for proletarian political revolution to oust the Stalinist bureaucracy and establish the rule of democratically-elected workers councils; just as today we fight for the same programme for the deformed workers states in China, Cuba, Vietnam and North Korea. We are proud to be the party of the Russian Revolution. If you want to see a world rid of imperialist war, cop brutality, poverty and oppression, join us!